Asia McClain has played a major role (maybe the biggest) in Adnan Syed’s efforts to land a new trial after his murder conviction in 2000. A week after testifying at hearings in Baltimore, McClain talked to ABC News about being a potential key to Syed’s freedom. 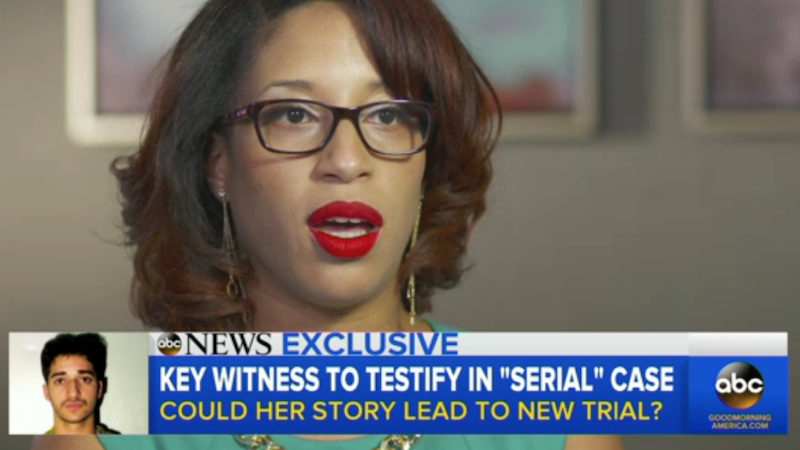 After McClain spoke to Sarah Koenig for Serial, ABC reports, she got a call from Syed’s lawyer asking her to testify in his post-conviction hearings. In testimonies last week, McClain again claimed she saw Syed in the library and spoke to him on Jan. 13, 1999, the date that prosecutors said Syed killed his ex-girlfriend Hae Min Lee. McClain adds that “setting a good example” for her kids was partially what spurred her to come forward.